Update Time! I finished my thesis! Long time, no write! I apologize for my vacancy on this blog and on social media lately -- over the last few months I have been busy with finishing my thesis! Now that it's finished, however, I am ready to get busy and create a lot of new blog content for you guys! I have several great entries in the works, so look forward to reading some interesting literary topics in the coming weeks. In order to make more content for this blog, would you like to hear more about literature in general, rather than just video games? Do you have any suggestions for me or questions you would like for me to answer? Feel free to discuss these topics in the comments. I would also appreciate it if you would take a few minutes to fill out a survey I have created to try to gain a better understanding of what my readers want to see. Thank you for your interest in my humble blog! When I was a sophomore in undergraduate school I wrote a ten page paper on the influence of the Cthulhu mythos on popular culture. Since then I have come to realize that the Cthulhu mythos is such an overwhelming force that affects so many aspects of literature and popular culture it cannot be contained to a mere ten pages. While I no longer have a copy of my sophomore paper, I would like to tackle the subject of the Cthulhu mythos again, this time focusing on a few of my favorite games that fall into the genre of Lovecraftian horror or Cthulhu-inspired Sci-Fi and Fantasy. 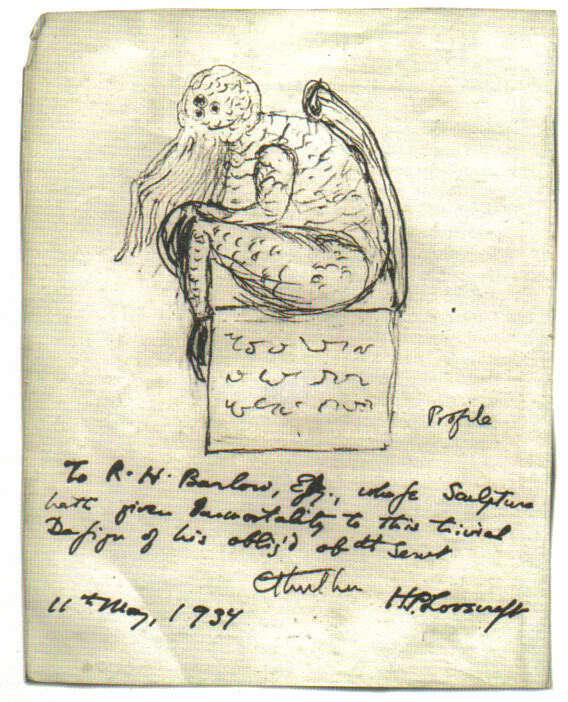 In case you're not aware, Cthulhu is a god-monster created by early 20th century author H. P. Lovecraft. Lovecraft created an entirely new mythos revolving around mysterious terrors like Cthulhu, and his works have influenced most modern stories in the sci-fi horror genre. Works of literature, games, and films in this genre are often called Lovecraftian horror, after the man who defined the genre. Genre-forming greats like Dungeons and Dragons and Robert E. Howard (author of Conan the Barbarian) have been heavily influenced by Lovecraft's creations, and thus the genres that these creators influenced have also heavily mirrored aspects of Lovecraft's writing. It makes sense, then, that video games have come to be greatly influenced by the Cthulhu mythos. If you want to know the exact scope of Lovecraft's influence on video games, you need only search for "Cthulhu" in the Steam store to see that there are hundreds of games claiming influence from Lovecraft -- and these are only the most evident PC games available on Steam. The list doesn't even count console-exclusive games. 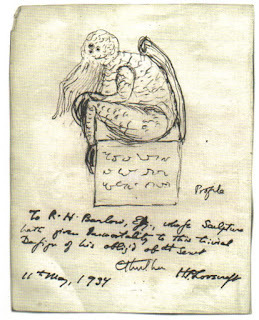 A sketch of Cthulhu by Lovecraft himself. This article will focus on a few of the most interesting Lovecraftian games I have played, many of which have influenced my life as a gamer and as a literary scholar. First on the list are some of the most well-known games by mega-popular game developer and publisher Bethesda. If you're a major fan of Bethesda, you likely know that Bethesda LOVES Lovecraft. The Elder Scrolls games and the Fallout games are littered with references and influences from Lovecraft's work. I first noticed this trend when I played The Elder Scrolls 3: Morrowind over a decade ago. At first the game seems like a vibrant, exciting open world experience for players of all ages. That perception lasts until the first time you encounter an "Ascended Sleeper" -- a Cthulhu-like monster that quite likely will scare the wits out of your low-level character when you first see one in a dungeon. The name for this creature most likely originates from Cthulhu's position in the story Call of Cthulhu as a sleeping monster found beneath the ocean. The primary antagonist of Morrowind is also heavily influenced by Lovecraftian lore. Said antagonist, Dagoth Ur, is based on Robert E. Howard's Dagoth, who in turn is partially based on Cthulhu and other "old gods" created by Lovecraft. Like Cthulhu, Dagoth Ur originally sleeps under a volcano (rather than the ocean), and rises to spread terror across the land. The Fallout series is not without numerous references to Lovecraft. These are less evident than the influences found in the Elder Scrolls series, but if you have a basic knowledge of Lovecraft's stories you should be able to spot the references scattered throughout the series. The most obvious reference to Lovecraft is the Dunwich Borers company, which has locations in Fallout 3 and Fallout 4. Dunwich Borers is a play on the title Dunwich Horror, which is a key story in Lovecraft's Cthulhu mythos. When the player enters the Dunwich Borers location in Fallout 4, she is presented with the story of the company that was "mining" the earth as a cover-up for their search for the Lovecraftian creature that they worship. This story is shown through flashbacks and terminal entries. For the full story of the Dunwich Borers in Fallout 4, see the following video. 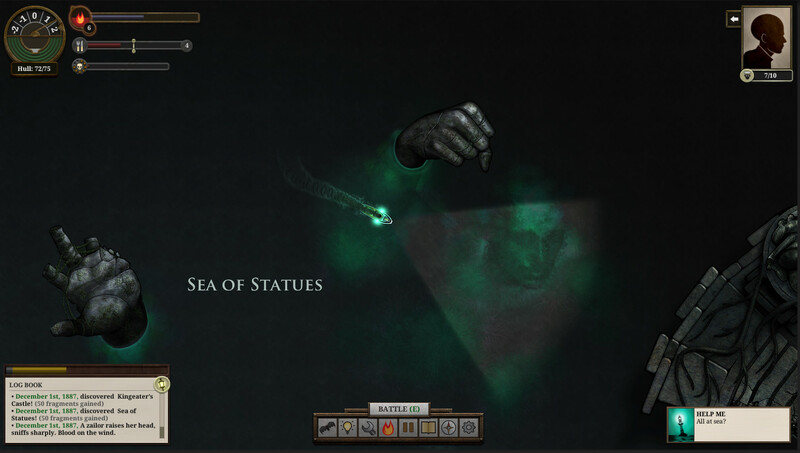 Another game that draws heavily from Lovecraft is Sunless Sea, a PC game that is based on the browser-based game entitled Fallen London. The tagline for the game is "Lose your mind. Eat your crew. Die." This tagline shows the deep connection that the game has to Lovecraft through its primary themes: sanity/insanity, oceanic exploration, and the unknown. The horror elements of the game require no introduction, as the first few seconds spent playing the game will give most gamers a serious eerie sensation. Like its predecessor, Fallen London, much of Sunless Sea is text-based, but this does not detract from the horror inherent in the story. 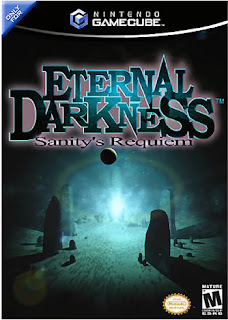 A list of Lovecraft-inspired games cannot exist without some mention of Eternal Darkness: Sanity's Requiem. This Gamecube exclusive is a cult classic, though many have not heard of it. Like Sunless Sea, Eternal Darkness revolves around a Lovecraftian view of sanity, but this game takes the theme of insanity further in that it actively tries to make the player feel as though she is going insane. While the game does include standard jump scares and other tactics normal to the horror genre, there are other aspects of the game (I won't spoil them here) that the player does not expect. Nintendo patented the sanity meter present in the game (which is much like a health bar, but measures the player character's sanity) before dropping the game's developers from their payroll, thus preventing any other games from utilizing this feature. Many other games could merit a mention in this article, but these are a few of the most prominent games in the Lovecraftian horror/sci-fi genre that I have played. Many space-themed games also fit the genre, such as Dead Space and the good and bad games from the Alien/Aliens franchise. Space games are easy to fit into the Lovecraftian horror genre, as Lovecraftian horror hinges on a fear of the unknown, and what is more unknown to modern man than space? All a creator needs to do is add some terrifying aliens, and a Lovecraftian tale has been created almost without even trying. 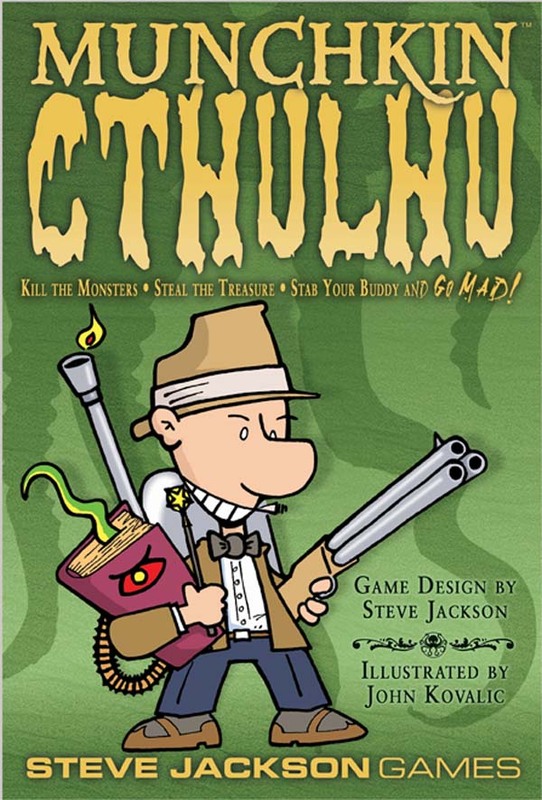 There is also a plethora of table-top games based on Lovecraft; most likely inspired by the mentions of Cthulhu and other Lovecraftian monsters in Dungeons and Dragons. 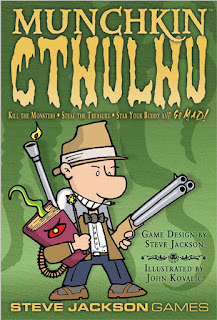 What are your favorite Lovecraftian or Cthulhu-inspired games? Is there a glaringly obvious game that I missed? Did I use the word "Lovecraftian" often enough in this article? Feel free to discuss these and more in the comments! One of the most popular and thought-provoking franchises in the Sci-Fi genre continues to be the Mass Effect trilogy (which will be receiving a completely original sequel sometime next year). There are numerous articles and videos on the internet about the ambiguous ending of the original trilogy's story, and any fan of the series you come across is likely to have a lot to say about the ending. I, personally, am usually a fan of bleak endings (unless it involves the death of beloved Harry Potter characters) and found the ending of the Mass Effect trilogy acceptable, if confusing. The developers re-made the game's three endings after receiving a huge amount of backlash from the fan community, and these re-made endings are acceptable to me, if unacceptable to most fans. Why do I find the ending acceptable? Because ultimately, no matter how much "control" the player has over the direction that the story takes, this is still a piece of literature that has been written by an author (in this case, the writers who created this story), and it is the brainchild of said author to be consumed and constructively criticized by players just as a book has a definite ending that one can like or dislike. But believe it or not, I'm not here today to talk about the ending of the Mass Effect trilogy. 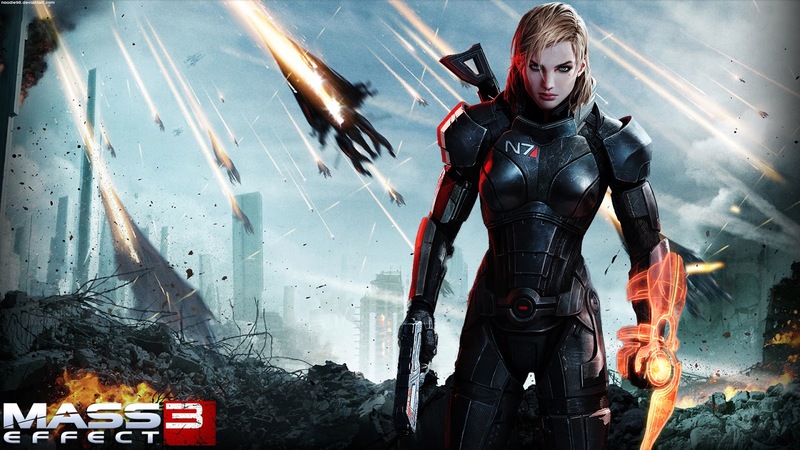 Many, many other people have already hashed out the good and the bad (and the very bad) of Mass Effect 3's final moments. Instead, I'd like to take a look at some of the characters in the series: specifically, Joker, Tali, and Wrex. What do these particular characters have in common? They each have complicated illnesses or disabilities that are intricately dissected and discussed throughout the trilogy. It is extremely rare for a video game to feature major characters with disabilities, and as a person who is disabled, I was surprisingly happy to find characters I could strongly relate to in a AAA video game franchise. Now, the argument has been made to me that Tali and Wrex do not qualify as disabled characters because their entire races suffer from specific diseases. I would argue, however, that in the universal world of Mass Effect, where many races from many planets intermingle in one society, the diseases that affect these particular heroes are setbacks that they must overcome, that other characters are unable to relate to. While the genophage does not inhibit Wrex's ability to aide Shepard or perform his duties to his fellow Krogans, it is a disease that he is constantly battling with and aware of at every step of the story. Every decision that Wrex makes is affected by his disease, and ultimately the aide of the Krogans in the final battle of the story hinges on whether or not Shepard is able to arrange for a cure to be created and given to the Krogans. If the game did not constantly remind us at every turn that the Krogans are sick I might not have included Wrex in this article. But the genophage is a huge part of Wrex's personal identity, and it cannot be ignored. Though you may not be able to tell from watching the video, limping along as Joker at an agonizingly slow pace while aliens are attacking the ship is a terrifying experience. I think the scene does a great job of giving players a bit of understanding of how scary it can be to be disabled, especially in the midst of a crisis. I also applaud Bioware for creating one of the very first player-characters that is disabled, even if you only play as this character for about five minutes. As I mentioned in the beginning of this article, disabled characters are very rare in video games, and playable characters with disabilities are almost non-existent. Occasionally you'll play a game where your protagonist has an eye patch (and is presumably missing an eye), but rarely does that actually hinder the character's abilities as it should (the main exception can be found in Metal Gear Solid 3, which I won't spoil here). I find it remarkable that Bioware was able to delve so deeply into the topic of disability with their characters in the Mass Effect series, but then, Bioware is known for being very progressive for a game company. Tali is my favorite character in the Mass Effect universe primarily because I have never before been able to relate to a game character in terms of my disability. I am eager to see how disability, gender roles, and all sorts of other important topics are brought to light in the newest addition to the franchise, set to release next year. 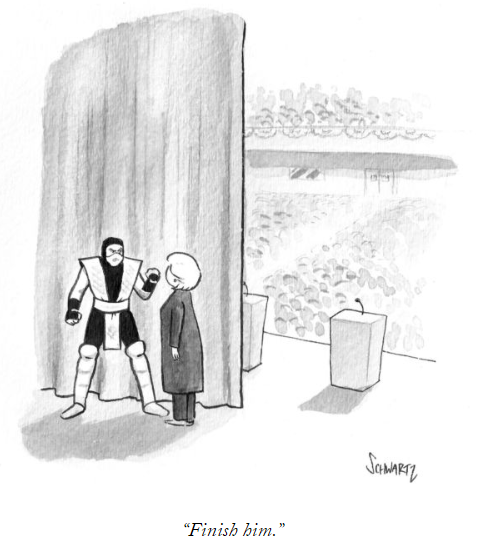 We've Made The New Yorker! What are your thoughts on video games being granted a presence in The New Yorker? In other news, I do apologize for not updating regularly. I'm almost finished with my Master's thesis and I have had no time for any extra writing of any kind. I will be participating in Sci-Fi Month again next month, however, so you can look forward to some entries then! Hi everyone! I must apologize profusely for this website's several month disappearance. If I am to be completely frank, I am still learning when it comes to website hosting. That means that, through an unfortunate email kerfuffle and an inopportune trip to the hospital, I lost the web domain videogamesasliterature.com (don't click that link -- it'll take you to the scalpers who want to sell me my domain back for almost $1,000). If you look in your address bar, the website is now www.videogamesaslit.com, and I hope it will stay that way as long as possible! So, please, if you like my blog and my writing, change your bookmarks to the new address! Or if you're too cool for bookmarks, make a mental note of the change. Note that everything else is the same: the Twitter page, Steam group, and Facebook content have not changed! So if you're following any of those, they will continue to update you whenever I have new content available to read. On to more interesting topics: I recently bought Disney Infinity (yep, I had to wait until the game was no longer being manufactured before I finally caved). Tune in soon to hear my thoughts on Disney Infinity and the history of Disney games. That article should be coming soon! In the meantime, enjoy E3, which is happening right now and has me really excited! 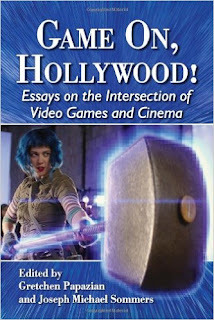 Book Review: "Game On, Hollywood! Essays on the Intersection of Video Games and Cinema"
I love browsing books on the shelf in my local library. I headed into the stacks yesterday to look for a book titled Vader, Voldemort and Other Villains (I thought it sounded cool) and ended up checking out a book I had never heard of before: Game On, Hollywood! Essays on the Intersection of Video Games and Cinema. My very first reaction was one of excitement; Ramona Flowers is on the cover. The authors in this book must know what they're talking about. 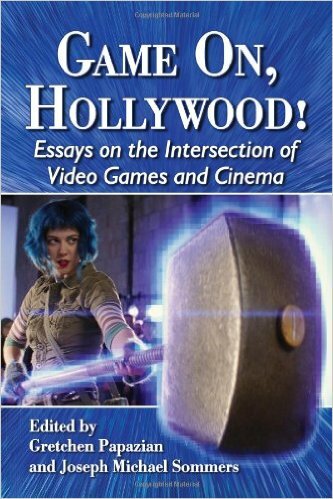 Now, you may note that this book is about the connection between video games and cinema (or movies and television), which is a tenuous but existent section of the literary world. You may imagine that every movie you can think of that was based on a video game has been pretty poorly made, and in many cases you would be correct. Hollywood has had a lot of trouble translating video games into films. The authors of this book agree, stating that "early games have a tenuous history of direct translation to film and television" (2) but then they list some games that, if you really think about it, have been quite successful in translating their stories to the screen. These games include Pokemon and Final Fantasy (I know Advent Children was silly at times, but somehow I keep watching that movie -- it just pulls me in over and over again!). The authors then discuss games that have cinematic cut scenes that are almost more film than game, with the most obvious entrant in that category listed first: Metal Gear Solid 4 (Ninety-minute cutscene, anyone?). By the way, I love the continued references in this book to the film The Last Starfighter. Show of hands: who's seen that movie? Furthermore, the authors question the concept of narrative itself, asking, "What actually is narrative today in 2013? What can it be? Is there anything that it can not be?" (12) This seems to be exactly what I am exploring in my blog, as I discuss video game narrative and its importance in the modern literary cannon. All of this, mind you, is in the introduction to the book, The meat is in the articles which make up each chapter. And what interesting essays they chose to feature in this collection. Most of the essays are about games I haven't played, and some are even about games I hadn't heard of before this reading (which is surprising considering my large personal collection of not only games, but also information on games). The first essay discusses player agency and how it relates to narrative in the game Buffy the Vampire Slayer: Chaos Bleeds, a clear tv show tie-in. This essay represents the concept of film-to-game tie-ins and how games in this category are able to stand on their own as representatives of their franchise. While a little dry, parts of this article were an interesting read; other parts seemed unnecessary. For instance: there's a lengthy definition of the term "gothic" as it is used in a literary context. I'm not sure that Buffy fits the traditional gothic storyline very well, but I can understand why many authors and critics want to categorize it as such. Of course, I haven't played the game that this article is primarily discussing, so I can't formulate my own opinion on its potential gothic origins. Mentions of important gothic works, such as The Castle of Otranto, are present in this chapter, so at least it is clear that the author is knowledgeable of the genre. Chapter two is once again about a game that I haven't yet played: Dead Rising. I sense a pattern: many academics writing about video games primarily play X-Box games. Since I rarely play X-Box titles, this puts me at a slight disadvantage. This article and the next, which focuses on the Western genre, have interesting points, but neither are specifically about topics that are within my immediate area of interest, so I must admit that I skimmed them. I was eager to get to the next chapter, which focuses on one of my favorite games: Prince of Persia: The Sands of Time and its abominable (in my opinion, even if I don't share that opinion with the article's author) movie re-make. The author argues (hilariously) that because the critical and general response to the film was only mediocre, rather than terrible and pitchfork-raising, the film succeeded where other game-to-film adaptations failed. Of course, the way that this author grades his game films on a sliding scale does not seem to account for films that actually were a great success, like Tomb Raider. I will likely take another look at this article when I write my own on Prince of Persia (which will be coming eventually -- it's such a wonderful, story-driven experience!). The rest of the articles are a mixed bag. Some of them are surprisingly interesting, such as the one on Dante's Inferno (Can you believe that I still haven't played that game?). Some of them are relatively dry. Overall, the tone of the book gives me hope. It's very exciting to see that there are numerous other scholars writing scholarly work on video games. It's especially interesting to me when scholars leave the beaten path and, rather than writing on extremely popular games such as Call of Duty and World of Warcraft, study significantly lesser known games like Buffy and Dante's Inferno. It's clear that the scholars writing in this book are real gamers with a passion for showing the world that video games are a valid medium. If you have any ideas of books that I should read (that I haven't already listed in the Bibliography), let me know in the comments! Papazian, Gretchen and Joseph Michael Sommers. Game On, Hollywood! Essays on the Intersection of Video Games and Cinema. Jefferson, NC: McFarland & Company, Inc., 2013. Print. Bastion: one of my favorite games of all time. I first played the game a few years ago when it was sold in one of the early Humble Indie Bundles. Now that the game is also available for PS4 and PS Vita I've decided that it's finally time to write about it. I immediately fell in love when I heard the narrator and realized that he was narrating everything that happens, because it's all part of the story. The narrator begins the story with "Proper story's supposed to start at the beginning. Ain't so simple with this one." The narrator then goes on to describe everything that happens; everything that the player causes the character she is controlling to do. The narrative can fluctuate based on the choices that the player makes. If you lead the PC, called simply "The Kid," to stay in one area and destroy all of the objects in sight, the narrator will say, "The kid just rages for a while." In a sense one could say that this narrator is telling the story in a stream-of-consciousness style. That style is highly unusual for a third-person narrator as he is narrating something that another person is doing, as opposed to narrating his own actions. Dictionary.com has several good definitions of "stream-of-consciousness"; here's a good one: "Of, relating to, or characterized by a manner of writing in which a character's thoughts or perceptions are presented as occurring in random form, without regard for logical sequences, syntactic structure, distinctions between various levels of reality, or the like." As the narrator himself says at the beginning of the game, he is not telling this story in a chronological or linear order. Instead, players experience the story from a point after the vague "calamity" that has occurred. Through finding objects and dusty remains of townsfolk we learn a bit about the world in which The Kid lived before said calamity. Certain things are never fully explained; for instance, players can never truly grasp what exactly the calamity was (Just that an act of war went horribly awry, as they tend to do) or why the paltry remains of the town are elevated in the sky. Even so, the story that is given is beautiful and heart-wrenching. Likely the vagueness of certain elements of the story are as ambiguous as they are because the player is gleaning information that only the narrator and The Kid know. These characters were not directly involved in the events that caused the calamity and through their own confusion and post-traumatic stress players must put together the pieces of the story. In some ways the delivery of this heart-wrenching story depends on the beautiful music and painted scenery in the game. Most of the few characters found in the game have their own vocalized theme song. Even if you don't listen to the lyrics (which are often surprisingly aggressive) the songs can bring a tear to your eye. The beauty of the world that has been destroyed by the calamity is still evident when The Kid visits various locations, and sadness can be found in the narrator's description of how the world once was, and the fact that this new world through which The Kid trudges is, though beautiful, no match for the pre-calamity world. At the end of the game, the player is presented with a hard choice. The player's own moral perspective is invoked here, as there is no clearly right choice. Arguments are made for each possible outcome, and the player's choice affects the future of the world in which she has just likely spent approximately 10 or so hours. 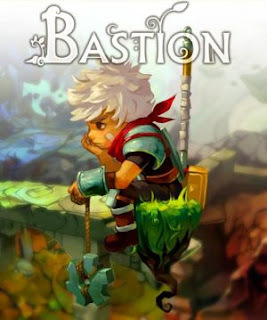 I won't say any more on the topic for fear of spoiling the game, but I will say that after you, the player, make this choice, you will likely wish to re-start the game in New Game Plus just so you can re-enter the world of Bastion and see what happens when you make the other possible decision. For any of you who have already played Bastion, which version did you play? If you've played multiple versions, which did you prefer? I will admit that I preferred the PC version over the PS Vita version (which is what I have most recently played). The graphics seemed to have been scaled down a tad for the Vita version (I haven't played the game on PS4 yet, so I don't know if this statement applies there, as well), though it has been a few years since I first played Bastion on the PC. Kirsten Rodning, M.A. English Literature: freelance writer and library associate. If you'd like to contact me, please do so via my website. If you would like to subscribe via LiveJournal, you can do so here. My goal in this blog is to review video games that I play in terms of their literary merit. Different approaches I may take with my reviews include comparing the video game to related literature or analyzing literary elements found within the story of the game. I also want to just have fun and create an exciting blog that fans of video games AND fans of literature can enjoy, while maintaining a fairly academic and educational tone. Please see my introduction for more information regarding my background and intentions with the blog. Videogames are, in essence, information, and the human act of telling stories, presented in new formats that involve the player. All Written Material Copyright 2014 Kirsten Rodning. Watermark theme. Powered by Blogger.